I wrote here earlier about Dr. Pepagomenos' treatment for gout, and I also wrote up what is known about him, including the fact that he attended Cleofe Malatesta Palaiologina in childbirth and was one of the speakers at her memorial service. I recently came across a small Italian publication of his notes on medicine, a collection of mostly short paragraphs on drug treatments for specific conditions. Some of these are copied from Dioscorides, or Galen, or Paul of Aigina, and some appear to be notes he collected from informants. 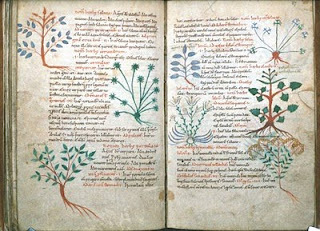 The first two notes of the book, printed here in Greek and my translation, are what Pepagomenos included on childbirth. Ἰατρικόν. Παρασημειώσεων τοῦ μακαρί του Πεπαγομένου ἐκείνου. 1. Πρὸς τὸ γεννῆσαι ταχέως γυναῖκα: κολίανδρον κουκκία ια’ δήσας εἰς πηνίον δίδου παρθένῳ κόρῃ, καὶ δησάτω ταύτην εἰς τὸν μυρὸν τῆς τικτούσης, καὶ μετὰ τὸ γεννῆσαι εὐθέως λυσάτω. ‒ ἐκ σμιλακίων ποιήσας στέφανον ἐπίθες ἐπὶ τὴν κεφαλὴν τῆς τικτούσης καὶ εὐθέως τέξεται. 2. Πρὸς δεύτερα γυναικός: παγούρους ποταμίους θὲς ἐπ´ ἀνθράκων καὶ ὑποκάπνισον αὐτήν, ἀγριοκαννάβου ῥίου δίδου πίνειν νῆστις. Medicine. Notes of the blessed [late] Pepagomenos. 1. For a woman to give birth quickly: bind 11 coriander seeds on a spool; give it to a young virgin girl [who] should bind it on the thigh of the woman in labor. After she gives birth, unbind it quickly -- put a crown of smilax cuttings on the head of the woman in labor and she will give birth immediately. 2. For a woman’s seconds [afterbirth]: put river crabs on charcoal and smoke her, give [her] fasting a drink with grated cinnamon wood. These notes say nothing about what he actually did in his own medical practice and if any readers know of crabs in the river Eurotas, I would appreciate being informed. The two prescriptions here are harmless and non-invasive. There are vague, associative, reasons for the use of each of the herbs, but possibly not in the forms prescribed. Coriander, of which there is a contemporary image above, was considered stimulating, and was used for inducing menstrual cycles and reducing pain. Smilax, taken internally, was an analgesic for painful menstruation, and for urinary tract infections. Cinnamon was used for nausea, menstrual cramps and heavy menstruation, among other things. I can imagine that the crown of smilax had some association to crowning. The book is Demetrio Pepagomeno, Prontuario Medico, ed. Maria Capone Ciollaro. Hellenica et Byzantina Neapolitana Collana di Studi e Testi. Naples, 2003. The triklinos is prepared: one readies the throne of the emperor where a curtain of gold silk separates the throne from the audience. 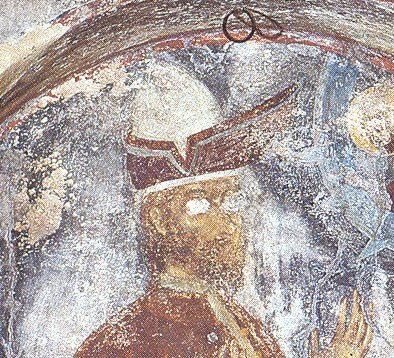 Among the archons, they wear their insignia, that is the skaranikion and others; those the emperor has designated dress the despot in the interior of the triklinos, at the last moment, in the bi-colored shoes and a violet or red kavvadion embroidered with pearls. The emperor comes out of his chamber with the crown and other insignia to his throne. The curtain is opened, everyone cries out "Chronia polla!" (πολυχρονίζουσι); then the two most important archons lead the proposed despot before the emperor. The emperor standing addresses him: "My Majesty raises you to Despot," and immediately everyone again cries out"Chronia polla!" One should know that not only when the emperor raises up a despost, but when he confers any office, even the most insignificant, he stands. The despot kneels and kisses the emperor’s foot. Once he is standing, the emperor puts on his head, with his own hand, a crown ornamented with precious stones and pearls which has four small arcs, in front, behind, and on each side, on which he is named son of the emperor; if it is a relative, there is only an arc in front; this crown is called the stemmatogyrion. This is Andronikos Palaiologos in 1403 or so, when he would have been about four years old. The inscription over his head identifies him as αὐθεντόπουλος - "Andronikos authentopoulos Palaiologos his son" which indicates that Manuel has officially recognized him as a "true son." By 1408, when he was eight years old, he had gone through the despot-making ceremony and was installed in Thessalonike as Despot there, under the fortunate guidance of Demetrios Laskaris Leontaris, military hero of the last Palaiologan naval success in the battle of the Sporades. But that came later. In 1408 Leontaris was responsible for trying to hold on to Thessalonike for Andronikos. Like Theodoros the year before, Andronikos was separated from childhood and sent out to put an imperial face on a very fragile imperial city. The city of Thessalonike was an island surrounded by Ottomans, and for a number of years it had barely been part of the Eastern Empire. Reports tell of the diminishing population, abandoned houses, and areas within the wall used for farmland. Unlike Theodoros, Andronikos was given a house in the lower city, and he seems to have been less restricted by his handlers than Theodoros, despite the tremendous insecurity of the city and what must have been constant anxiety about what to do. At least, he was in a real city and not perched up on a mountainside under a bell jar. Somewhere between 1408 and 1423, Andronikos contracted leprosy. I had said he had the family disease of gout, in resistance to the various names the chronicles gave his illness -- leprosy, elephantiasis, and the "holy sickness," which is translated as epilepsy. Tim Miller, authority on Byzantine medicine, kindly explained away my problem with the chronicle sources. He says that the holy sickness hadn't been the name for epilepsy since the 4th century; the medical people knew leprosy was not generally contagious and a person so affected did not have to be isolated. A major historian says Andronikos "was prematurely wasted and destroyed by disease" but we don't know when it developed. We know less about Andronikos than any other Palaiologos. He was born in Monemvasia in 1400, while his father was visiting Venice, Paris, and London, in search of aid for Constantinople. Two sisters and a brother died there. 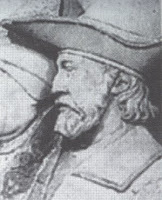 His uncle, Theodoros I, had sold the major cities of the Morea to the Knights of Rhodes who might be better able to defend them than the Greeks, and had withdrawn to Monemvasia. Then there were a few years in Constantinople during which three brothers were born -- Constantine, Michael, and Demetrios -- and Michael died in the palace of plague. Andronikos had fifteen years in Thessalonike, and much of that time the city was beset by Ottoman raids, and finally the siege of 1423. He was apparently fairly debilitated from his illness by this time. 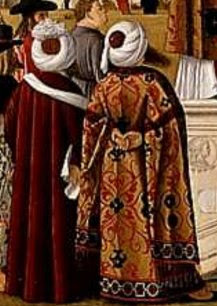 After Andronikos handed over Thessalonike to the Venetians on 19 September 1423 -- all of this was done with messengers back and forth to Constantinople for advice and approval -- he traveled, along with his son John, to the Morea on a Venetian galley. The galley left Andronikos off in Nauplion and he went over the mountains to Mantinea for a while. It is difficult to know why: the Google aerial view is extremely interesting, especially if you have been there, but it doesn't explain anything about Andronikos. I don't know where he could have done much spending on that high, austerely beautiful, nearly empty plateau. We don't know if he visited Cleofe and Theodoros at Mistra, or if anxieties about illness on the part of Theodoros kept him away. He died at the age of 28 or so on 4 March 1429, either in Mantinea, or in Constantinople where he took vows as the monk Akakios ("sinless") in the Pantokrator, and died and was buried there. Just like his father. A chronicle that gets a lot wrong says that he joined a monastery on Mt. Athos where he died. One source says that when Constantine became Despot -- 1443 -- he made Andronikos' son John governor at the castle of Navarino. John disappears after that, and he may not even have existed, but some of those wisps of evidence suggest that Constantine made deliberate efforts to be in touch with John, and with Theodoros' daughter Helena, and you don't see that kind of thoughtfulness from anyone else in the family. We have information about each of his brothers that lets us construct some sort of personality: for Andronikos, we have nothing. It is easy to make assumptions based on early childhood separation, illness, too much responsibility, and too many threats, but we don't really know who he was. Tim Miller has a forthcoming book on Byzantine leprosy. 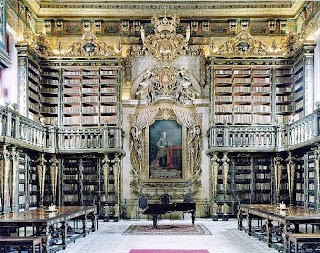 The most useful sources for Thessalonike are the books by John Melville Jones: Venice and Thessalonica 1423-1430: The Venetian Documents, and Venice and Thessalonica 1423-1430: The Greek Accounts, Archivio del Litorale Adriatico, Unipress, Padua, Italy. 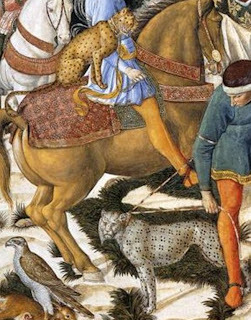 In working on the entries for the Leopard Wranglers, I read five different books on Gozzoli and the frescos in the Medici Chapel. 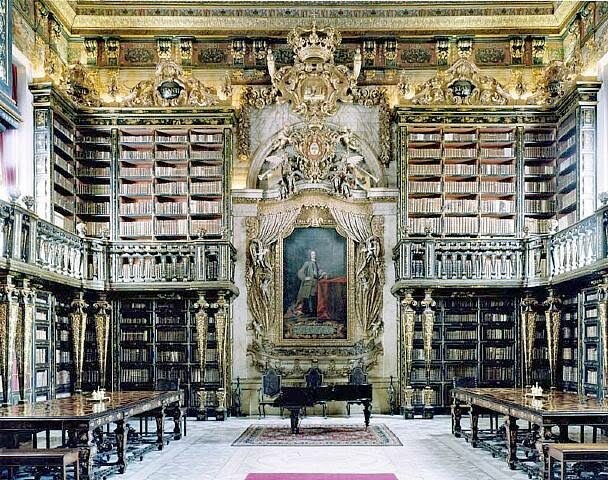 Not one of the authors in those books -- all art historians and so presumably trained to look at details -- managed to make the distinction between leopards and cheetahs that Gozzoli did in the frescos, although one did use a shotgun-technique of referring arbitrarily to "leopards," "cheetahs," and "hunting leopards." [Late note: Joan Lloyd in African Animals in Renaissance Literature and Art makes the distinction.] 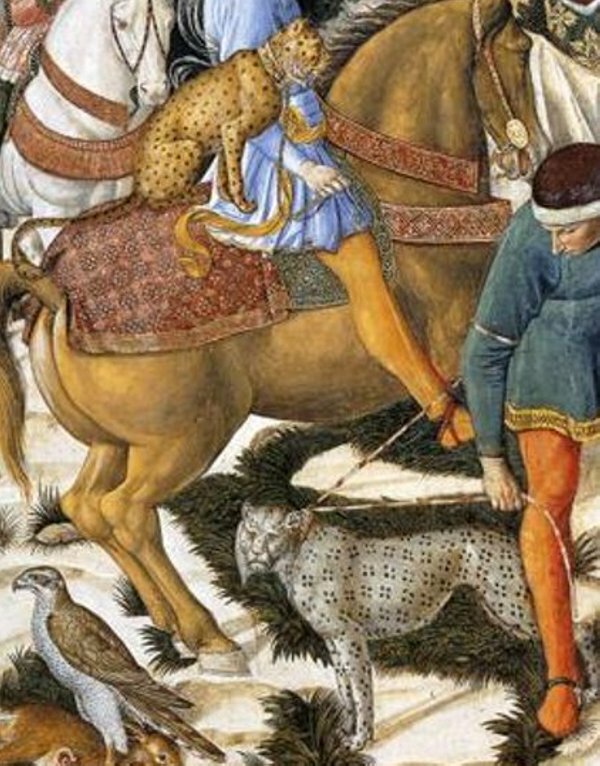 Gozzoli paints both cats together here. 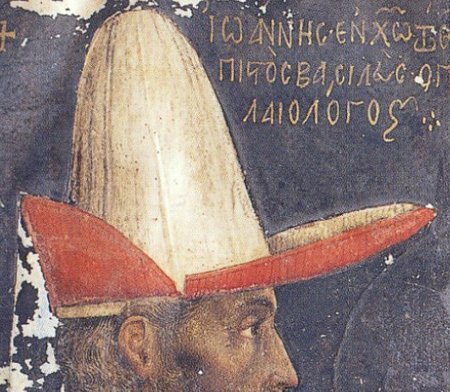 I have read too many comments this year identifying the imperial Palaiologan hat as a skiadion, a shade-hat. Interestingly, it is almost impossible to find a contemporary Greek representation. The only one I know, I have used here before, but it has nice detail. Pseudo-Kodinos, who told us about the Leopard-Wranglers, has a lot of entries on the skiadion. "The skiadion of the despot is entirely covered with pearls, on his aer (see the tails on Manuel's hat below) is his name in gold embroidery. . . . If [the despot is a young boy] he is on horseback, he wears the skiadion. When he becomes an adolescent, he wears the skiadion in the palace. . . the skiadia of the relatives of the emperor, who are despots, are red and gold, embroidered with gold thread, and have a cross embroidered with pearls. . . The skiadion of the sebastokrator is red and gold, embroidered with gold thread. His aer is like that of the despot." Headgear is not enough to distinguish rank at the Palaiologan court. You need the full description of robes and colors, embroidery on robes, and colors of shoes to have any sense of security, but it does let you know that however poor the empire had become, there was full employment for the gold-embroiderers. 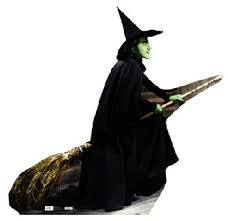 The skiadion has been repurposed in the witch hat. Update: one of my most faithful readers sent me another late 15th C image of skiadia, from the Istituto Ellenico in Venice. Emperors might have worn the skiadion in private, but in public performance -- at least in the West because that is where the images come from -- they wore the kamelaukion. I don't know if the name refers to a camel's hump. It is rounded and sectioned, rather like a melon, and is sometimes called a melon hat. John's had jewels on top that could be changed. 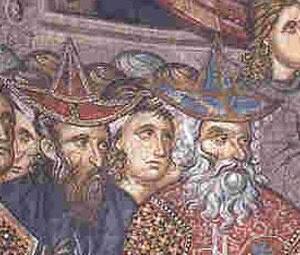 To my knowledge, there is no Byzantine image of an Emperor in a kamelaukion, but the Westerners loved it and made images of Manuel II, John VIII, and Thomas Palaiologos. This is Manuel, more or less -- his beard was white -- from the Tres Riches Heures of the Duc du Berry. 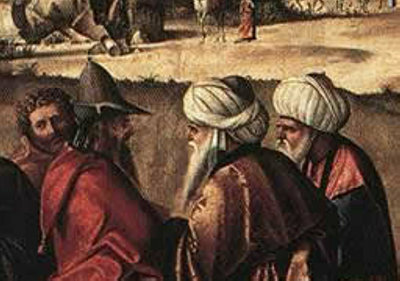 John's hats are more familiar, and he was more concerned about his personal style. Western artists, when not painting visiting Palaiologoi, used the kamelaukion to represent "exotic person from Eastern country where they have better hats than us." There is only one Byzantine representation of a kamelaukion that I have been able to find, and I have given it an entry of its own, the portrait of Manuel Laskaris Chatzikis at Mistra. There are, I think, exceptional reasons for this portrait, but you will have to read about them there. Further update: the same reader found a miniature image of kamelaukia in the 14th-C manuscript of the Tale of Alexander in the Istituto Ellenico of Venice. Here, even though by a Greek artist, they are used to identify exotic foreigners. So it may not indicate Palaiologan use.